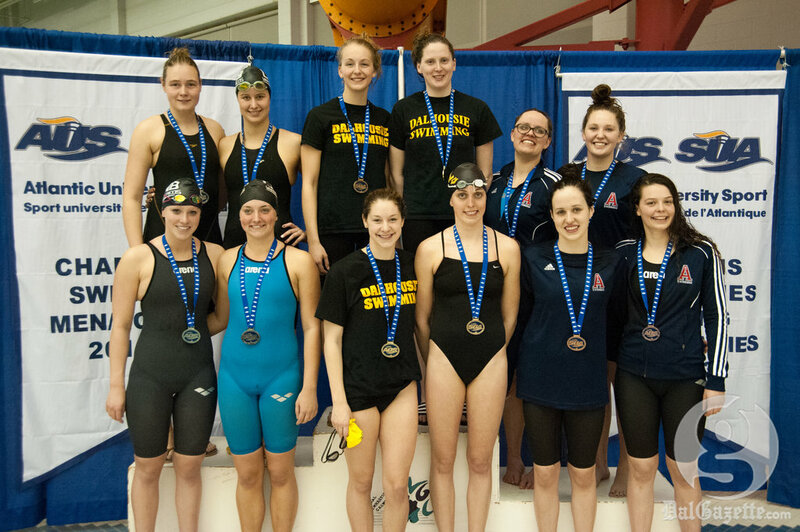 Dalhousie’s swimming teams are the AUS champions. This is the 15th consecutive win on the men’s side and the 12th straight title for the women. The Tigers topped the podium in 30 of the 38 events they swam in at this past weekend’s meet at UPEI. Dal’s Kyle Watson and Katie Webster were named swimmers of the meet. James Profit was the male rookie of the meet. Men’s team captain Kit Moran believes it’s an achievement worth celebrating. “Winning 15 straight is a significant accomplishment, something that is not currently held by any other swimming squad in the other conferences,” he says. David Sharpe, Molly Wedge and Rachel Shin were among the many to have great swims, but this is standard fare for the Tigers. What’s not standard is how they are training. Tapering is a practice where swimmers relax on their training to have higher energy levels so they can perform at their peak. For them, their focus is on nationals. Nationals will not be easy for the Tigers. The teams are currently ranked ninth in the country for the men and eighth for the women. Historically, Dal has not performed as well as expected at the CIS championships. With a new coach, this could be the year to change that. And coming off a win like this one, maybe they’ll end up in the top five. CIS championships will take place in Calgary from Feb. 21-23. ← Merger of two minds?